How bad are cupcake cakes (ptui! ptui!)? Check out cake wrecks: Where professional cakes go horribly, hilariously wrong. The girls will love that site. They fancy themselves bakers, and admittedly do much better than those on display. I never judge a cake by it’s color, only by chocolate content. The dreaded “cupcake cake” is a cake made out of cupcakes sort of mushed together. Supposedly makes it easier to eat because you just pull off a cupcake, instead of the normal cut & fight over who gets what piece. They’ve made up some pretty horrible cakes – like a vague football shape for a Superbowl cake, that sort of thing. I assumed as much. And yes, Mia and Amy can both make some pretty fancy cakes. There are just very few customers up here. The G-kids the theme of their choice for birthdays though. 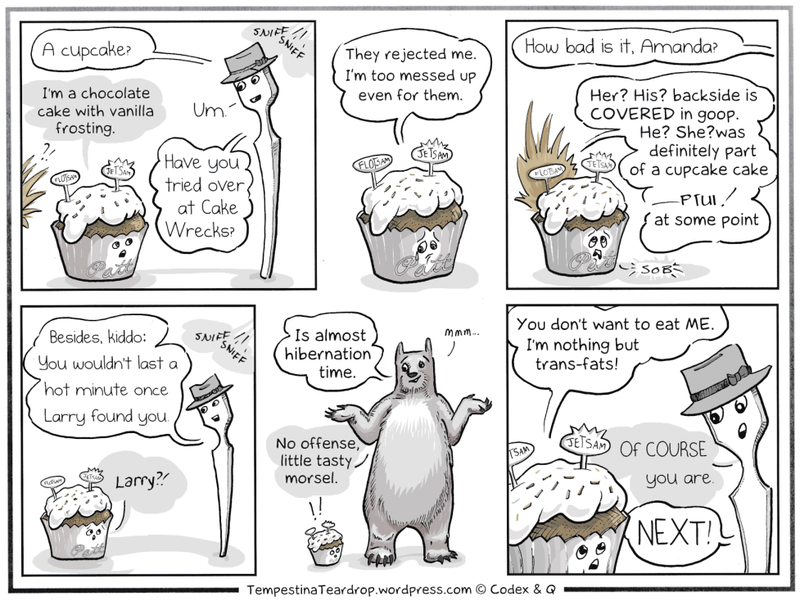 Another example of the harm caused by the Cake-riarchy. Sigh. When will it end? When will we get beyond the othering of complex carbohydrates and (trans)fat shaming?